This picture below describes how I felt about the desserts I ate on my recent trip to Paris. 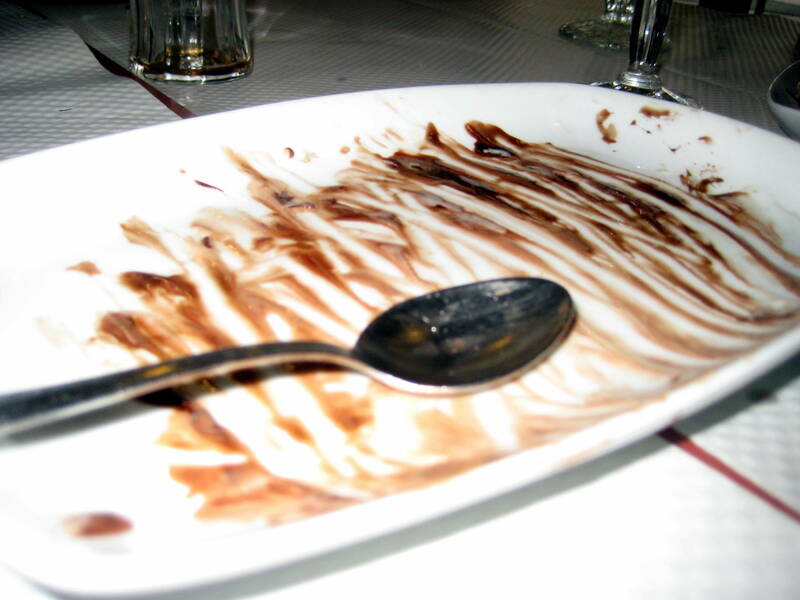 If I could have licked the plate without appearing disgustingly rude and uncultured, I would have. Silence ensued, as the others’ eyes met mine, awaiting what would certainly be an extremely important announcement (perhaps involving fire or blood) – to be deemed worthy of such a complete interruption. You see, sometimes things are just too good to be left inside to experience all alone. I was distracted from the flow of the discussion because of the scrumptious delicacy I had just ingested. Despite what was happening around me, I just had to share the incredible joy I felt in tasting the richness of the chocolate and the texture and blend of such wondrous flavors that brought utter delight to my palate. I couldn’t keep it to myself any longer. At dusk they got up and went to the camp of the Arameans. When they reached the edge of the camp, not a man was there,  for the Lord had caused the Arameans to hear the sound of chariots and horses and a great army, so that they said to one another, “Look, the king of Israel has hired the Hittite and Egyptian kings to attack us!”  So they got up and fled in the dusk and abandoned their tents and their horses and donkeys. They left the camp as it was and ran for their lives. I love chocolate and I love dessert. However, they are not anywhere in the same dimension with what I love about my God and all he has done for me. He has shown me indescribable love, given me a purpose for living, forgiven me, given me hope and a future, given me clear directions on how to live life and build a marriage and family – and filled me with indescribable joy. Why would I ever want to hold this in? And yet sometimes I do just that. May I freely “interrupt” life around me to share such a wonderful and amazing God. This entry was posted in Uncategorized and tagged good news by jeanieshaw. Bookmark the permalink. Exactly what I needed to hear this morning. Thank you.